Power Up | Arts and Culture | Style Weekly - Richmond, VA local news, arts, and events. The fifth InLight exhibition promises surprising illuminations. Audience interaction plays a big part at InLight. Passersby explore an exhibit at the 2009 event. A ghostly house framed in an alley, its doors and windows rhythmically illuminated. A thread of light snaking across the canal at Tredegar between two video screens. A mysterious glowing window in Shockoe Slip that reveals an underground dance club. These memorable moments, and others, have marked the evolution of Richmond's popular InLight exhibition during the last four years. Five years ago, the staff and board of 1708 Gallery were looking to commemorate the nonprofit's 30th anniversary. After a couple of board members saw Nuit Blanche, a night of elaborate light installations and performances in Paris, they decided to invite artists to illuminate Richmond beyond gallery walls. 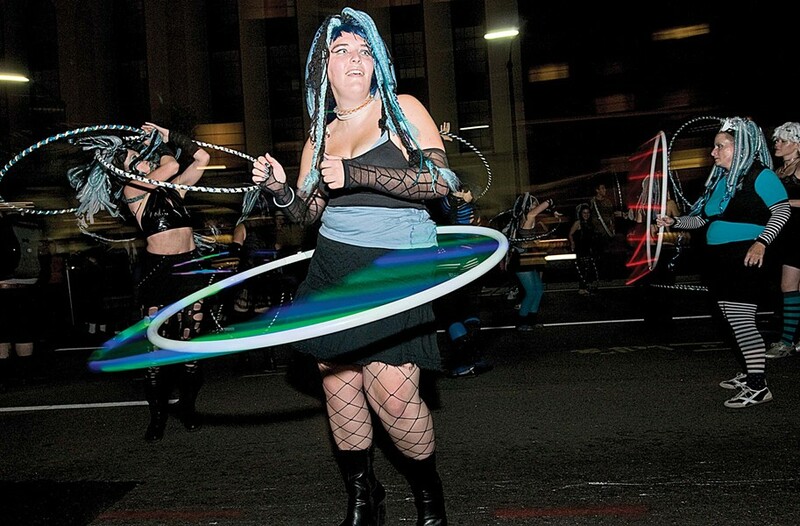 The first InLight celebration took place on downtown Broad Street on a September evening. It opened with a torrential rainstorm that eventually petered out, making for a "magical" night, says Emily Smith, 1708's executive director. After the success of the inaugural InLight, 1708 chose to try it a second time, in a different part of the city. It hovered around CenterStage downtown, migrating to Shockoe Slip for its third year and Tredegar for its fourth. On Nov. 2, the gallery will bring InLight back to the neighborhood where it was born. "It just made sense with our neighbors' efforts to make the Art Walk area an arts district to hold InLight close to home," Smith says. "And First Fridays has grown so much within the past five years. With InLight's fifth anniversary and First Fridays on the same day this year, it's going to be like First Fridays blown up." The arts district means the neighborhood's arts and cultural venues could receive economic incentives from the city. The proposal would encompass Broad Street from Belvidere Street to 13th Street. There's another variable that keeps each InLight fresh. Each year, 1708 seeks a new, accomplished young curator to manage the event. This year, the gallery called out to professionals in New York, Philadelphia, and Washington. Melissa Ho, assistant curator at the Smithsonian's Hirshhorn Museum, fit the bill. Educated at Princeton University, the University of Pennsylvania, and Carnegie Mellon University, Ho most recently curated "Belief and Doubt," an installation by collage artist Barbara Kruger that appears at the Hirshhorn through 2014. 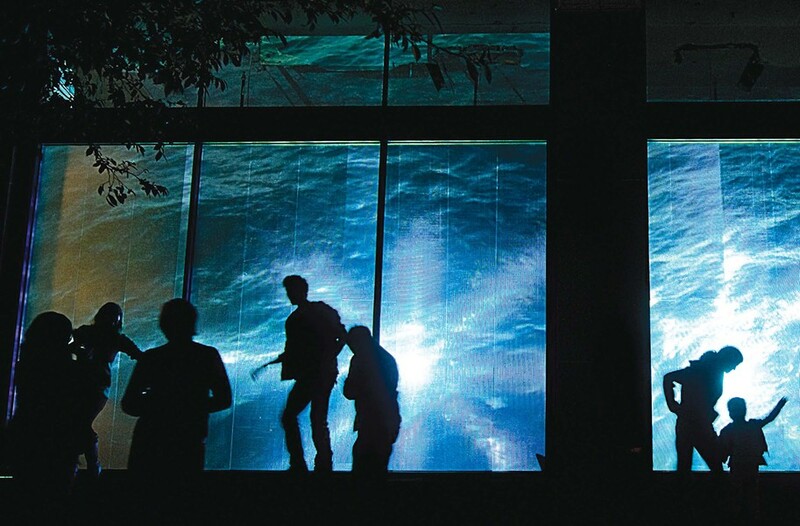 Although Ho wasn't familiar with InLight, the concept intrigued her because of its capacity for public interaction. Ho later wrote in her curator's statement that, "Light is perhaps the ideal medium for art that occupies public space and aspires to engage a wide audience. Intangible and radiant, light activates its surroundings, breaking down the division between art object and viewer." Ho reviewed more than 80 proposals for InLight, a record number. By the beginning of September, Ho had taken her "leap of faith to commission new work." Of this year's 21 artists and artist groups, only four live and work in Richmond, such as the local band the Trillions, whose notes trigger light. Several have never visited the city. The unknown heightens the excitement for 1708 and the guest curator. "I'm always surprised by what ends up being my favorite," Smith says. "Prior to the show, I've only seen proposals. I never know how the installations will unfold until the day of." 1. Look for the hidden installations. "They're not that difficult to find, but some of them are tucked away." 2. Participate in BYOB — bring your own beamer. This segment of the evening, created by Richmonder Norberto Gomez Jr., invites people to bring projectors to screen their work and make it part of the luminary festivities. 3. Don't miss the community lantern parade. If you don't have time to make a lantern at home, there will be a workshop the day of the parade at Adams and West Marshall streets at 6 p.m. Or come with your ready-made lantern at 7 p.m. You'll be given an LED candle for the parade, which begins at 7:30 p.m. The fifth InLight Richmond takes place on West Broad Street from Henry to Adams streets, from 7 p.m. to midnight on Friday, Nov. 2. For information, visit 1708gallery.org or call 643-1708.